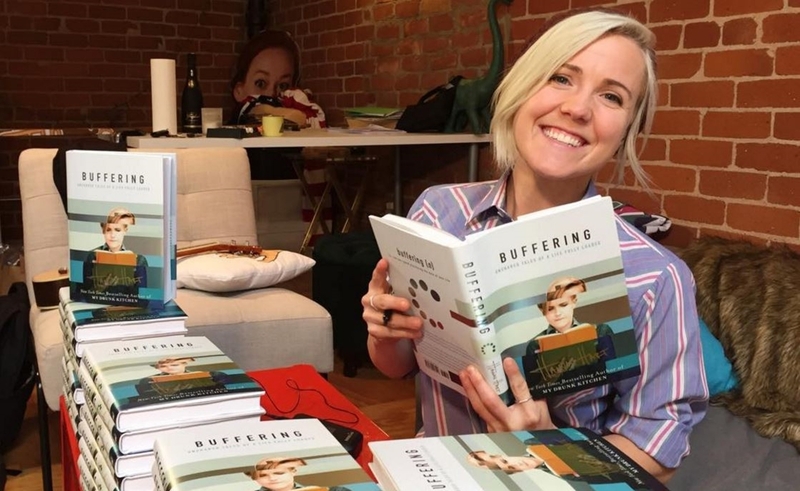 Hannah Hart’s second book, Buffering: Unshared Tales Of A Life Fully Loaded, isn’t your typical YouTuber fare, in that the release represents a deeply personal collection of narrative essays about family, faith, love, sexuality, self-worth, friendship, and fame — all culled from her personal journals. Taking a more revealing approach, however, looks to have paid off in spades. Buffering has debuted at #4 on the New York Times Best Sellers list in the print hardcover category, #8 in the e-books category, and #5 for combined print and e-book sales. These are incredible numbers for Hart, whose first book, My Drunk Kitchen, was one of the first literary outings by a digital creator in 2014 — though that book struck a starkly different tone with comedic recipes inspired by her beloved YouTube series of the same name. My Drunk Kitchen was also a New York Times Best Seller. Both books were published by Dey Street Books, an imprint of Harper Collins. In an interview with People, Hart described some of the hardships she’s faced throughout her life as detailed in Buffering, including growing up with a devout Jehovah’s Witness father (whose ideals drastically conflicted with her own identity as a member of the LGBT community) and a mother who suffers from schizophrenia. Hart also touches on her own struggles with self-harm, ADHD, and depression.